Low carb smoothie recipes generally calls for lots of fruit and ingredients with low carb content, like plain yogurt and low fat milk. You are unlike to find chocolate, ice cream and other ingredients with high sugar levels in low carb smoothie recipes, because of their high carb contents. Low carb smoothies should contain as little as possible sugar. Low carb smoothies are perfect for low carb eating plans and diets, like the Atkins Diet. They often contain protein powder, although this is generally an optional ingredient. It is important to strike the right balance between low carbs and tastiness. Therefore, experiment with low fat unsweetened flavored yogurt instead of plain yogurt. Or, add some sweetener for taste. 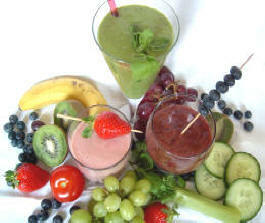 Feel free to send us your favorite smoothie recipes with us by clicking here. We welcome your contributions. Put the ingredients in the order above in the blender. Blend on low speed for 20 seconds and on high speed for 20 seconds. Click here if you want to submit a smoothie recipe recipe.